This half-day tour began at Edgware Road tube station, opposite our first building, Paddington Green Police Station. A short cycle away, we stopped at our first school, King Solomon Academy (formerly Rutherford School, Leonard Manasseh for the LCC, 1958-60). Though it was difficult to see much of the school from outside the gates, the main building’s distinctive upside-down pyramid, on the roof, was clearly visible. After cycling west along Regent’s Canal, we arrived at Trellick Tower, Erno Goldfinger’s 1972 tower block. Though almost identical to Goldfinger’s earlier project, Balfron Tower, in Poplar, which we saw later, there are slight differences: at Trellick the boiler room, with rounded edges, protrudes from the service tower, and the building’s external timber panels are more intricate. A few stops later came Denys Lasdun’s buildings for SOAS and UCL’s Institute of Education (built 1970-76). Though more famous for his design of the National Theatre and Royal College of Physicians, Lasdun’s university buildings in Bloomsbury are no less accomplished. Following lunch at the Brunswick Centre, Patrick Hodgkinson’s 1967-72 project designed under the tutelage of Leslie Martin, we continued on to Shoreditch Fire Station, built between 1961 and 1963 and designed by A R Borrett and T M Williams of the LCC. Still a working fire station, its four staff maisonettes on the top floors, set between private patios, give the building’s appearance a uniquely geometric feel. Heading further east, and after stopping at two more Lasdun projects and the Cranbrook Estate (by Berthold Lubetkin, Francis Skinner, and Douglas Bailey), we arrived at St Paul’s Church, Bow Common (Robert Maguire, 1958-60). Maguire took his inspiration for the church from Brunelleschi’s Pazzi chapel in Florence and Santa Fosca on the island of Torcello. Fr Gresham Kirkby, the priest who commissioned the church, despised stained glass and so commissioned a mosaic by Charles Lutyens depicting angels. Our penultimate stop was Balfron Tower (1965-67). The earlier of his two London high-rise blocks, Goldfinger designed the building with lifts and services in a separate tower, detached from the main body of the building, necessitating a number of walkways every few storeys. 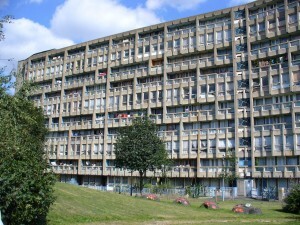 In the hope of dispelling some of the myths about the perils of high-rise living, Goldfinger moved into Balfron Tower with his wife in 1967, living there for two months. The trip finished at Robin Hood Gardens (designed in 1964-70 by Alison and Peter Smithson for the LCC/GLC, built 1968-72). The estate comprises two main buildings: at the time of the tour, both were awaiting demolition, with one still partly occupied. The architecture is undoubtedly innovative, but the location of the site (next to the Blackwall Tunnel Approach) may well have been a challenge simply too difficult to overcome. Since the trip, demolition of the estate has begun. Controversially, the V&A has acquired a three-storey section of the building, with a view to putting it on display in the future. Many thanks to Elain Harwood for organising this wonderful tour which took us across London and gave us the opportunity to take in more than twenty brilliant examples of housing, schools, universities, public buildings, and churches.